The rental market has now cooled long enough to be indicative of a longer-term trend — a sign that relief is finally here for renters, though for many, it’s too late. The slowdown in Seattle-area rent increases that began late last year has continued into the first part of 2018, as the crush of new apartments opening across the region catches up with demand in the fast-growing region. When the last quarterly landlord survey was released, in January, it showed average rents across the region had dropped nearly $50 from the prior quarter — the first significant rent decrease of the decade. Now, the newest survey is out and it shows rents have started to tick up again as part of a seasonal pattern that happens in the springtime virtually every year. 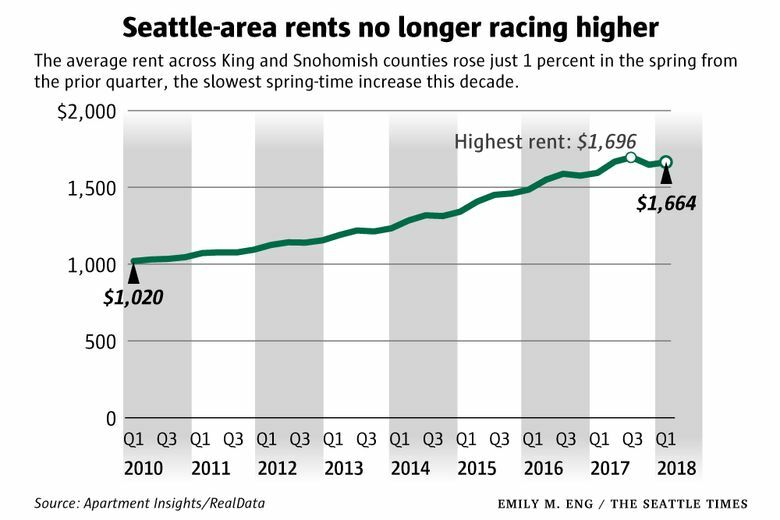 But the average rent across King and Snohomish counties went up just 1 percent — or $17 — compared to the prior quarter, the smallest springtime increase of the decade. And rents remain below the record highs reached last summer and fall. It’s a significant turnaround from a year ago, when Seattle-area rents were rising about eight times faster than the national average. Now Seattle rent increases are only slightly bigger than the rest of the country. In the city of Seattle, only one neighborhood — First Hill — saw rents grow at least 1.5 percent from a quarter ago. Rents actually dropped a bit in Belltown, Fremont/Wallingford and North Seattle, according to the data released by Apartment Insights/RealData, which surveys landlords across the region. In the region’s suburbs, rents also dipped slightly in some parts of the Eastside — in Kirkland, Mercer Island/South Bellevue and the Woodinville area — as well as in sections of South King County, in Federal Way, Tukwila and Des Moines. Compared to a year ago, rents regionwide were still up 4.4 percent, but that was the smallest annual increase since 2011. For many renters, the changes have come far too late. Rents across the region have soared 59 percent since 2011, adding an extra $620 to the average renter’s monthly bill. The average rent for all unit types across both counties is $1,660, and it’s closer to $1,880 in Seattle — among the most expensive in the country. But the recent cooldown has now extended long enough to be indicative of a longer-term trend. Analysts have pointed to a wave of new apartments opening since 2014; a record number of new units opened last year in Seattle, and even more are expected this year. The changes are most recognizable in the pricey neighborhoods of downtown Seattle and South Lake Union — home to one-third of the new apartments that have opened across the region since last year. Compared to the high-points reached last fall, rents have dropped 6 percent in both downtown Seattle and South Lake Union. And the rate of vacant apartments has grown from 3.8 percent to 6.2 percent in the last year in downtown, and from 5.3 percent to 6.7 in South Lake Union, giving renters more options and negotiating power. But that doesn’t mean those areas are suddenly affordable. The typical rent is now $2,340 in downtown and $2,130 in South Lake Union. John Mullally, whose family has been in the apartment business since the 1940s, said he started noticing a slowdown around September at the 1,450 older units he owns in North Seattle and Queen Anne. Fewer people were applying to his apartments, and the people who were applying didn’t meet the background and income check standards as often. Since then Mullally has reduced the security deposit and offered a half-month of free rent for new leases, but he still has more apartments sitting empty than he used to. In some cases, rents are dropping for people renewing their leases; in others, developers are lowering their sights after over-pricing their new buildings. 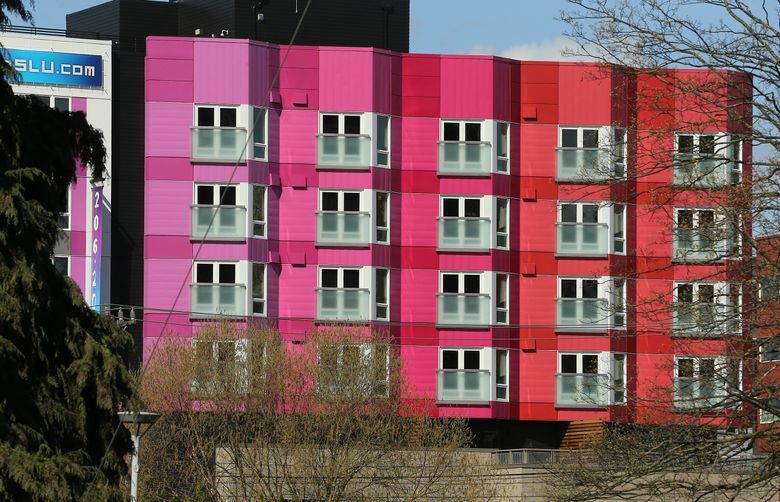 Modera, a new building in South Lake Union, had offered 1-bedrooms starting at $2,260 last fall, according to VeryApt, a website that tracks rental changes, and an archived web page for the building. Now that same floor plan is being offered for as low as $1,980. Other new buildings are offering deals to entice residents. Stratus, a new luxury apartment building opening this month across from the Amazon Spheres, is giving away up to two free months rent for new leases. It has more than 100 new apartments available, with two-bedrooms starting at $4,200 a month. Across Washington, cities like Tacoma, Bellingham, Puyallup, Spokane and Vancouver are all seeing rents rise faster than in Seattle. The rental market offers a stark contrast to the for-sale market, where home prices are still rising as fast as ever across the Seattle metro area. Unlike the surge in apartment construction, there are very few homes for sale being built across the region. Compared to a quarter ago, rents grew the most in First Hill (up 5.8 percent), East Bellevue (up 3.9 percent), and Sammamish/Issaquah (up 2.3 percent). The rent increases come against the backdrop of steep property tax hikes that apartment owners often pass on to renters. Joe Leavitt said his landlord in the Phinney/Ballard area raised the rent for him and his roommates by $100, citing the building’s higher property tax rates. “We thought it better to take the rise in rent than lose our place in a neighborhood we really like,” Leavitt said, so they renewed at the higher rate. Regionwide, 5.2 percent of apartments are sitting empty, up from a 4.7 percent at this point a year ago, the Apartment Insights/RealData survey found. In an attempt to fill up apartments, landlords last quarter offered renters perks like reduced parking fees that cost property owners an average $30 a month over the course of a lease, about double the amount from the prior quarter. Looking just at large projects of at least 50 units, the region has added 40,000 new apartments since 2014, boosting the total number of rentals in large buildings by 22 percent. That far outpaces the rate of population and job growth, but follows about 20 years of slow apartment construction. Apartment construction activity has held steady but developers have reported recently that it is getting harder to get their future projects financed and built because profits off rent are no longer keeping up with increases in construction costs. There are about 35,000 units across the region still in the pipeline that haven’t been built yet, roughly the same as a quarter ago.